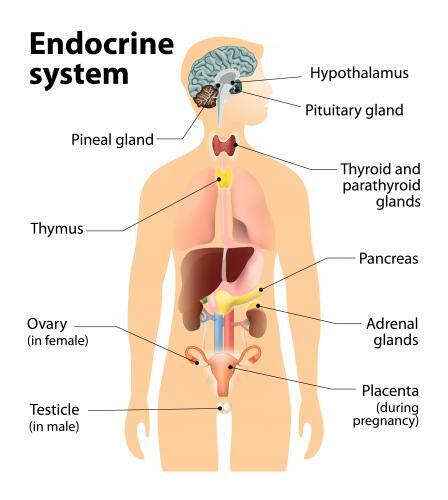 Our body's endocrine system is made up of different glands which produce and secrete hormones necessary to control the activities of various cells and organs of the body. The master gland of our body's endocrine system is known as the pituitary gland. The pituitary gland is known as the master gland because it controls and regularizes multiple other glands present in the human body. The pituitary gland is vital for the reproduction of human body. In the absence of it, not only growth of the body is affected, but different body functions also fail to function properly. The pituitary gland is present in the middle of the pineal gland and the hypothalamus in the brain of the human body. It is located right behind the bridge of the nose. The pituitary gland is connected to the human brain with the help of thin blood vessels and cell projections of nerve cells. More than 70 percent of the gland's total weight is due to its frontal lobe which is the largest part of the gland. The pituitary gland varies in its size but is normally very small in size, similar to the size of a small pea. Normally height of this gland varies from 7 �" 12 mm. In females, its size normally increases during pregnancy. The pituitary gland controls and regularizes range of glands including adrenal, thyroid, testicles and ovaries. Although this gland is the controlling master of the aforementioned glands, but it itself gets information and guidelines from the hypothalamus which is responsible for creating the link between the endocrine system and the nervous system. We can think of hormones and glands as a part of a communication string in the human body, where pituitary gland gets orders from the hypothalamus. These orders are in the form of hormones which tells the pituitary gland that how much hormones must be sent to the other glands. 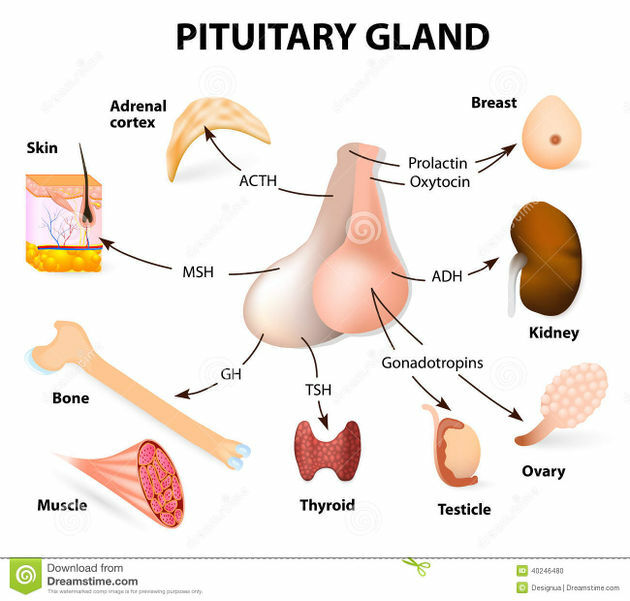 After that, the pituitary glands pass on this information to the other glands by secreting hormones that tell these glands a number of hormones they need to produce. Oxytocin triggers contractions during childbirth. This hormone helps to prevent water loss from the body by dropping the output of urine and thus helps the kidneys to re-soak water. These hormones help to relieve the sensations of pain and provoke the feelings of pleasure. It creates growth hormones which are vital for the growth of our bones and muscles. It creates Prolactin, which is responsible for the production of milk in the mammary glands. Normally, these hormones are produced after every one to three hours and work in parallel with the body's circadian rhythm which means maximum hormones are produced during the day time and fewer hormones are produced during the night. Production of hormones other than these depends on multiple factors like the menstrual cycle and etc. Mostly, problems like an abnormal growth of the pituitary gland arise due to cysts, and cancerous tumors. These abnormal growths are not uncommon; in fact, one- sixth of the population suffers from a tumor or small cyst of the pituitary. Generally, these tumors are not malignant and do not spread to the other parts of the body as cancer does. But these tumors can cause serious problems like hypopituitarism; a condition in which tumor does not let the pituitary gland to produce sufficient hormones, or stimulates it to produce excessive hormones or both conditions simultaneously. When production of a major hormone like this is reduced, it can cause other glands to malfunction in terms of either producing too much or too scarce of their own hormones. It can also adversely affect the organs which depend on the pituitary gland and thus may lead to a wide variety of syndromes like gigantism, central diabetes insipidus, galactorrhea, and erectile dysfunction. The growth of the tumor can be tracked down with the help of CT or MRI scan. Blood tests can also be carried out to diagnose any problem in the pituitary gland. In some cases, if the problem gets serious, then tumor must be surgically removed along with some part of the gland surrounding it. Fortunately, pituitary gland can carry out its functions in a normal way even if 95% of it is removed and thus it is not a big problem for the patient. Besides surgery, tumors can also be treated through medication. These medicines regulate hormones. At times, when the presence of a tumor is not causing any harm to the patient, it may be left untreated provided it is not growing. Doctors in such cases usually wait and critically observe the patient's condition before taking any action. MLA (Modern Language Association) "Pituitary Gland: Specifics, Functions & Diseases." ScienceAid, scienceaid.net/Pituitary_Gland_Specifics_Functions_%26_Diseases Accessed 23 Apr 2019. Chicago / Turabian ScienceAid.net. "Pituitary Gland: Specifics, Functions & Diseases." Accessed Apr 23, 2019. https://scienceaid.net/Pituitary_Gland_Specifics_Functions_%26_Diseases. Thanks to all authors for creating a page that has been read 933 times.